Franklin Quest - Baseball Scorebook Keep track of everything during the baseball game with this convenient scorebook. Scores up to 50 games. Easy-to-follow scoring instructions. One-page format tracks batting fielding and pitching statistics. Easton - Pine Tar Stick A staple of baseball pine tar is the tried and true method for improving bat grip. Genuine pine tar improves grip and feel. Easy application stick. 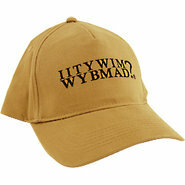 Generic - IITYWIMWYBMAD? Hat These funny baseball caps are an easy way to score free drinks! Champro - Team BP6 Baseball Pants - Mens - White Gear up for the game with the Champro Team BP6 Baseball Pants. Warp knit fabric and double knees for comfort and durability. Adjustable inseams let you make these pants up to 5 shorter. Traditional fit. 100% polyester. Imported. Evoshield - Salute T-Shirt - Mens - White/Charcoal Give a salute to your favorite sport and carry your baseball style anywhere with the Evoshield Salute tee. Loose fit. Screen printed graphics. 58% cotton/42% polyester. Imported. Evoshield - Baseball Tech Tee - Mens - Black Heather Perform at your best with the Evoshield Baseball Tech Tee. Loose fit. Screen printed graphics. 100% polyester. Imported.